A University of Portsmouth Cluster for Sustainable Cities project has won 1.6 million euros to help cities solve food, water and energy management challenges. Increasing demands for food, water and energy often exceed the capabilities of any one city, region or government. Combined with population growth and the expansion of cities, a collaborative approach is required to meet these demands. The “CRUNCH: Climate Resilient Urban Nexus CHoices: operationalising the Food-Water-Energy Nexus” project will help scientists, small and large businesses, cities, non-governmental organisations and local stakeholders, to work together and develop integrated approaches to food, water and energy management in cities. The CRUNCH project investigates food, water and energy as one complex system, leading to increased knowledge and discoveries that cannot emerge when investigated separately in ‘silos’. It will combine an integrated Decision Support System and visualisation models with expert knowledge in waste, food, material flows, water and energy management and urban planning, architecture and urban governance. The international project, led by Professor Steffen Lehmann, Director of the Cluster for Sustainable Cities at the University of Portsmouth, will start on 1 April 2018. The three-year project involves 19 partners from six countries and is funded with 1.6 million from eight different funding agencies. In the UK, the project is funded by the ESRC, the AHRC and Innovate UK. The six participating municipalities are: Southend-on-Sea (UK), Eindhoven (Netherlands), Gdansk (Poland), Uppsala (Sweden), Miami (USA) and Taipei (Taiwan/Chinese Taipei). 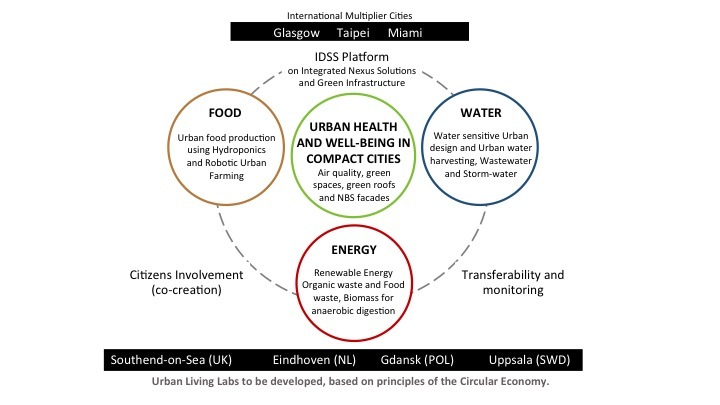 Professor Steffen Lehmann said: “This is a very prestigious initiative and we are very happy to be funded for the next three years to tackle the challenge of urban transitions to develop international connections and collaborations worldwide on the food, water, energy nexus approach. Key researchers from the University of Portsmouth include Professor Steffen Lehmann, Professor Djamila Ouelhadj, Dr Julia Brown and Dr Alessandro Melis. The project was selected as part of the joint call ‘Sustainable Urbanisation Global Initiative’ (SUGI), organised by Urban Europe JPI and the Belmont Forum with support from the European Commission. Fifteen projects were selected from a pool of 79 projects.